All 10 blocks are elevated on an environmental deck to accommodate a basement car park. The slanted orientation of selected blocks helps to reduce possibility of overlooking into units directly across the pool, heightening the sense of privacy. At the same time, these units are orientated to approximate northern and southern direction. The four corner blocks are also strategically rotated to align with the site boundary to make way for larger pool and facilities. Dedication to the site planning also ensured that each block has a proper entrance on the first storey. 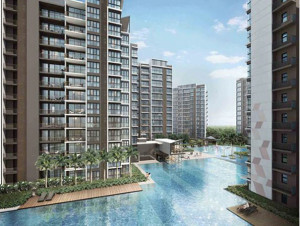 Most units are designed to have either the reservoir or land- scape view. This development is projected to achieve the BCA Greenmark Goldplus award through various provisions like water conservation and North-South orientation of blocks. The use of products like low volatile organic compounds (VOC) paint, environmental friendly adhesive and non-chemical termite treatment are integrated. The ideal living environment is not just the spatial quality but the make and materiality of the space. Universal Design (UD) Mark has also been awarded in recognition of meeting the needs of all ages and abilities. The blocks are planned in series of 4 units to a core. 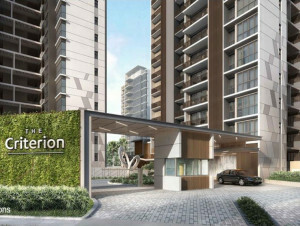 This allows better ventilation for the units and more exclusivity in each lift lobby. There is a 2 meter rain cover at every lift lobby to help prevent driving rain. The units slide out in opposite direction to create opportunities for cross ventilation and maximum views to the reservoir and the golf course. 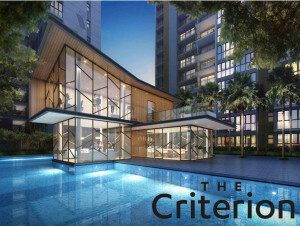 These privileged units enjoy a combination of dual balcony, with living and dining positioned amidst of it. This direct connection to the balcony allows for more flexibility to cater for the different needs of the end users. As residents enter through its balcony, it portrays the idea of living in a landed property with a garden at its entrance. All units also have proper enclosed kitchen with natural ventilation. Flexi-units are created to provide multiple room options for potential buyers to shape their new home according to their lifestyle. We believe that a home does not stop evolving. As a family matures, people’s needs changes. We wish to create a home that is able to embrace new changes when the time comes.